Franchising is often compared to the wheel. If you have a good design, why bother reinventing it? This idea fits well with Hurricane Grill & Wings. With over 40 locations, this franchise is growing fast. From their signature sauces and relaxed atmosphere to their family-friendly pricing, Hurricane has quickly become a restaurant people can enjoy. If you’re not in the mood for their signature wings, they have delicious grill options and fresh salads available. However, if you’re on the market for a great opportunity, they can satisfy your needs too! I recently spoke with the president of Hurricane Grill & Wings, Martin Oâ€™Dowd, about the company and their franchise opportunity. Tell us a little about Hurricane Grill & Wings. Hurricane Grill & Wings is a full service restaurant with 43 locations, known for its 32 signature sauces and our relaxed, beach house atmosphere that makes every visit to Hurricane a â€œflavor vacationâ€. All menu items are cooked fresh to order with high quality ingredients and zero trans fats. Some menu options include fresh salads, 100% Certified Angus Burgers and Grilled Mahi-Mahi. A young man, named Chris Russo, who lived in Fort Pierce, FL had a passion for flavors. He learned to cook at a young age alongside his mom. Eventually he put his knack for flavors and his creativity together and rented a 1,400 square foot building to sell just what he wanted- wings and beer. The space faced the water and people from the area flocked to, Chrisâ€™ Wings, the restaurant for his fresh, jumbo wings and cold beer. People kept asking Chris to open more locations and this eventually led to informal franchising and Chris letting people buy his sauces. After a period of organic growth, the people at Dunkin Donuts saw the potential and bought the rights. To this day, out of the 32 sauces on our menu, 25 are the original sauces from Chris in 1995. Tell us a little about your franchise opportunity. We believe our franchise opportunity is unique that we focus on return on investment for franchisees. They are able to invest about $550,000 and get a 3 to 1sales to investment ratio. 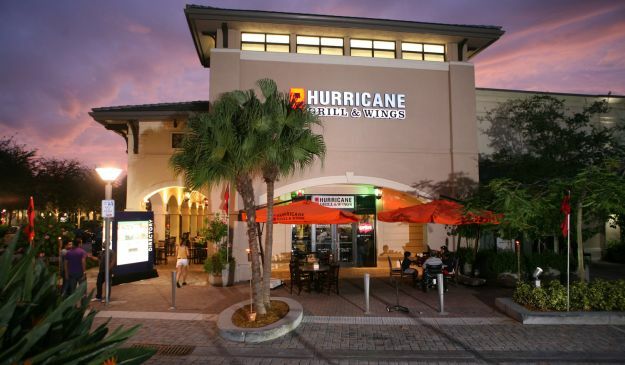 The investment in a Hurricane Grill & Wings franchise is attractive because it is a full service, family oriented restaurant that appeals to anyone ages 7-70. The brand is just as accepted in Arizona, Michigan and Indiana as it was originally and still is in Florida. At Hurricane Grill & Wings, we focus on simplicity- 3 pieces of cooking equipment in the kitchen and a 3 step process of food preparation to ensure that it is functional across a large base of restaurants. Property- Our property size sweet spot is anywhere from 3,500 to 4,500 square feet with 150-170 seats. We like locations that are either free standing or end caps and a property, that weather permitting has significant patios space. Return on Investment- the ROI for Hurricane Grill & Wings is in the top 10% of the industry. Also Hurricane Grill & Wings was named in the top 50 fastest growing companies in the industry for the past 3 years. Simplicity- From an operatorâ€™s position, simplicity is the basis for everything we do- from the simplicity of creating menu items, to the simplicity of making the 52 menu items and simply having the best food. Quality-Hurricane Grill & Wings puts such a priority of high quality of food from our fresh jumbo wings, 100% Certified Angus Burgers and fresh produce for salads and sides. Most importantly- our 32 flavors that make the possibilities of flavor endless for every meal allowing the customer to take a flovor vacation each time they eat at Hurricane Grill & Wings. By the end of 2013, we will have over 100 restaurants which is a huge milestone for us. What are some lessons you’ve learned about business during your time as president of the company? At Hurricane Grill & Wings, we are incredibly sensitive to price. We are committed to keeping the average check at $12.70 to continue to be a family friendly concept that allows the whole family to come and enjoy a meal together. Do you have any advice you’d like to offer potential franchisees considering this opportunity? Everyone considering opening a Hurricane Grill & Wings should experience the food first and then make your decision. Additionally, donâ€™t listen to corporate, just talk to the franchisees so you can get a real sense of the opportunity and what being a franchisee will be like. Next articleStarting a Cleaning Business?